1. Anti-UV: 99.9% UV protection for outdoor performance and the ability to protect the facial skin. 2. Anti-Fog: Specially made with anti-fog film, which prevents from condensation that may cause by rough breathing from various outdoor activities and sudden climate changes. 3. Anti-bacterial: 99.9% SGS Certificated anti-microbial performance certificate! It is being protected from bacteria such as E.coli and staphylococcus aureus. 4. Comfortable: It is wearable for everybody because frame is flexible from PC-ABS material. 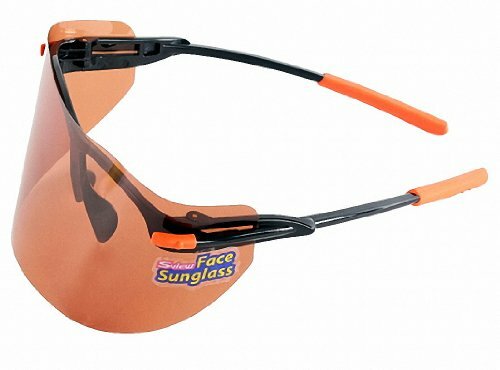 Face Film Sunglass can be wearable on the glasses and you can feel comfortable from light weight even long time using. 5. Easy Assemble: Unique design with easy assemble and disassemble into the lacks of sunglass frame by slide on, off the film without any hooks or clips. 6. Optimum Size: We provide various sizes, small, medium and large, so you can enjoy Face Film Sunglass with your preference and choose the size as TPO. 7. Durability: Use of the same material as that of top-class sunglasses not only ensures comfortable eye care but product's firmness and durability. 8. Perfect component: In the Face film sunglass package, there are pouch for storing product, cleaning cloth, sticker with logo and user guide. -Application: fishing, hiking, golf, jogging, driving, etc. This product made by special optics film, the same materials with premium Sunglass, so it blocks 99.9% UV rays and prevent condensation that generates from temperature difference, also it stops propagation of the bacteria with 99.9% antibacterial effect. In particular, face sunglass blocks UV rays to protect eyes and skin trouble such as freckles, age spots and others, so it's essential to out door activities with strong sunlight. If you have any questions about this product by Sview, contact us by completing and submitting the form below. If you are looking for a specif part number, please include it with your message.